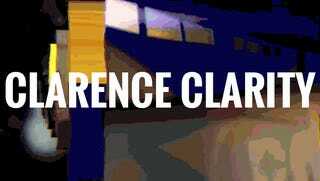 Clarity Clarence is the name of a well known meme on the internets. Clarence Clarity is the name of an upcoming electro-R&B artist from the UK, and this guy is no joke. What is electro-R&B you ask? A nonsensical wordfusion that becomes a serious groove of body motion, and that kind of summarizes Clarence Clarity. The eclectic mix of neo soul, g-funk, and experimental electronic extracted from the 90s explodes into of a sonic mixture of Shlohmo, James Blake, MIA, Flying Lotus, and my SEGA Genesis. It sounds ridiculous on paper, it is pure aural magic in practice. If internet presence is any indication, Clarence Clarity is still a relative unknown. His fantastic 20 track debut album — No Now — released in March, yet there is hardly any mention of the soft-spoken artist among the music press. Don’t let that put you off though. Sip the pleasurable sound waves. Drink. Drown. It’s worth it.